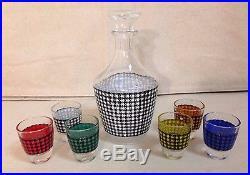 France Whiskey Decanter & 6 Glasses. France / 1950’s-60’s / Marked “France” on the bottom of all pieces. 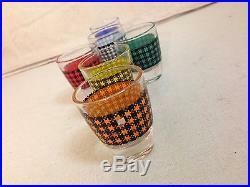 Plaid pattern in differnet colors. Excellent used condition / No chips or cracks. One shot glass has small bit of paint missing (see photo). 7″ tall, 3 1/2″ at widest spot. 2″ tall, 1 1/2″ wide at rim. Grading conditions are subjective. You must be your own judge when deciding the condition of listed item. We suggest that you wait until you are invoiced before you pay for these items. If you desire any other conveyance you may request it. If the cost is higher than our allowance you will be billed for the additional cost. If Possible we suggest that you arrange for pick-up of larger items. In the case of large furniture items pick-up can often be arranged through nationwide moving companies as an add-on to a household load. We will be as cooperative as possible but we will not be responsible for crating or packing. This can apply to any item that weighs in excess of four US pounds. You be the judge. 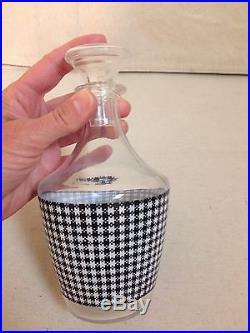 The item “FRANCE MID-CENTURY WHISKEY DECANTER WITH 6 GLASSES” is in sale since Monday, July 13, 2015. This item is in the category “Home & Garden\Kitchen, Dining & Bar\Glassware”. The seller is “unnsp49″ and is located in Lancaster, Pennsylvania. This item can be shipped to United States, Canada, United Kingdom, Denmark, Romania, Slovakia, Bulgaria, Czech republic, Finland, Hungary, Latvia, Lithuania, Malta, Estonia, Australia, Greece, Portugal, Cyprus, Slovenia, Japan, China, Sweden, South Korea, Indonesia, Taiwan, Thailand, Belgium, France, Hong Kong, Ireland, Netherlands, Poland, Spain, Italy, Germany, Austria, Russian federation, Israel, Mexico, New Zealand, Philippines, Singapore, Switzerland, Norway, Saudi arabia, Ukraine, United arab emirates, Qatar, Kuwait, Bahrain, Croatia, Malaysia, Chile, Colombia, Costa rica, Dominican republic, Panama, Trinidad and tobago, Guatemala, El salvador, Honduras, Jamaica, Antigua and barbuda, Aruba, Belize, Dominica, Grenada, Saint kitts and nevis, Saint lucia, Montserrat, Turks and caicos islands, Barbados, Bangladesh, Bermuda, Brunei darussalam, Bolivia, Ecuador, Egypt, French guiana, Guernsey, Gibraltar, Guadeloupe, Iceland, Jersey, Jordan, Cambodia, Cayman islands, Liechtenstein, Sri lanka, Luxembourg, Monaco, Macao, Martinique, Maldives, Nicaragua, Oman, Pakistan, Paraguay, Reunion.